Got a couple of neat things here today, the first is something we haven't seen in a while, some 3D Art. Hektious whipped up this dual image of our favorite Amphibian. Hek's also got four new pictures on his Fan Art page including this one which is a whole bunch of differently styled Frys. He didn't explain so I got no clue. Check 'em out. And over in Fan Fiction we have a new installment in Dwayne Anderson's alternate universe tale of derring-do called Space Age Doofus. The latest installment is part ten. Ok, where to start. So yeah, I've been gone a lot lately causing things have been a little sporadic around here. Sadly for me, but good of FM/TLZ, I'm done running around the countryside playing for a while so it's time to start shoveling out the backlog. Let's start with some Fan Art from Spaceman130. He sends four. I chose this one 'cause it'll show up the best, a study of Leela in blue. He's also got some Jurassic Bark inspired sketches (you know the ones I mean). Over in Fan Fiction there's also a new fic by Spaceman130. It's called Falling Rain, Spilling Blood. It's inspired by the PlayStation 3 game Vampire Rain: Altered Species and in it when people in New New York begin to mysteriously disappear, Fry, Leela, Bender and Hermes are recruited as part of a secret covert ops team by the EIB (Earthican Information Bureau) to eliminate the threat to the human population. Here's a bit of crossover Fan Art from Awalex - it's Bender meets Terminator 2 Judgement Day. Greetings nerdlingers! Did you know that the word “nerd”, the root word in nerdlinger, was originally spelled knurd, which if you hold your screen up to a mirror you'll notice is the word drunk spelled backwards. I'll drink to that! 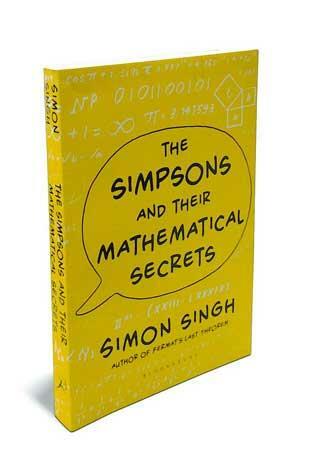 This and other amazing factoids are available in this awesome new book, The Simpsons and their Mathematical Secrets by Simon Singh, which I got a free review copy of, which is why I'm plugging it. New before someone reminds me that this isn't exactly a Simpsons site, I should mention that there are four whole chapters that deal exclusively with Futurama. In this book you will learn that The Simpsons and Futurama writing team are bristling with maths PhDs and that the series contain enough mathematics to form a university course - and then some as the author reveals the fascinating details of these hidden maths (<-- it's "maths" 'cause the publisher is in Merry Olde England and that's how they say it over there). I've read part of it and it's a fun read, even mathophobes should be entertained by it. It's available from that place that's named after the large women, and probably others as well. Buy several for xmas gifts. Four years, Four Better or For Worse. Yup, it's been four years since that cover and first few pages appeared here. I am, or course, talking about Pieter Antonissen's fan comic Four Better or For Worse because tonight we bring you the conclusion of this stunning work. But wait! There's more! Also included are seven, count 'em, seven pages of special features including more naked butts that you can shake a finglonger at. The new stuff starts on page 191. Thanks Pieter, it's been a wonderful ride. Sadly, Piters sez “It'll probably going to be a loooooong time before a new fancomic will rise to the surface - if ever”.